Today, Brunei’s main export is pretty well known even to non-Bruneians. Our oil and gas exports are the main items driving our export markets and the nation’s income. But oil was only discovered in 1929 in Seria. However, historians have indicated that Brunei had been very active in the ancient maritime trade for centuries. So, what was it that Brunei did in all those years to ensure that ships from China, Vietnam, Thailand, Indonesia, Malacca and other nations to come and trade with Brunei? Brunei had geography on her side. Brunei was ideally located among the busy trade routes in Southeast Asia. Its sheltered bay protecting ships from the monsoon winds and positioned as a halfway house for the travel journeys from Korea and China to the Southeast Asian nation states all no doubt played a role in making ships come and stop by to trade with us here in Brunei. Geography alone is not sufficient. Brunei was known to have a high quality of forest, sea and natural products which are needed by the Chinese and the Europeans. These were known to be in demand in the court of China and among the elites and wealthy families in Nanjing and Beijing as well as in the castles and mansions of Europe. Not all of these products came from Brunei, but they were traded through the Brunei Port brought by the natives to the Brunei Port. The total exports of Brunei can be summarised as camphor, turtle shell, bird’s nest, yellow bees wax, gharuwood, lakawood, dammar, rattan, sago, pearl and gold as well as spices. Most of these originated from Borneo, but some were also obtained from the Sulu people and the people in Eastern Indonesia. Many of today’s readers would not know what are these items. This article will deal with each one and explain what they are, where they come from and what they can be used for. Camphor or kapur barus or kapura (in Sanskrit) or kafur (Arabic) was the most important of Brunei’s forest produce and had been regularly mentioned in the early historical records of nations dealing with Brunei. In the Chinese records, it was mentioned as one of Brunei’s tribute to China as early as the 10th century. In 1225 AD, Zhou Rugua mentioned that Brunei produced four different varieties of it. 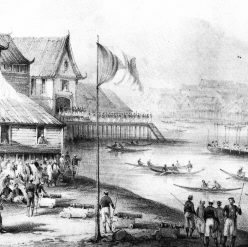 Brunei’s camphor was of the highest quality in the South Sea and was worth its weight in gold. DF Lach in his book ‘Asia in the Making of Europe: The Century of Discovery’ (1965) said that the true camphor produced in Borneo is valued like gold in India and brings a higher price than the camphor of China. Camphor is a waxy, flammable, white or transparent solid with a strong aromatic odour. It is found in the wood of the camphor tree. Camphor is the crystrallized camphor oil in the tree trunk of the Kapur tree. Camphor contains a chemical that is very useful for medicinal purposes and used extensively in ancient Chinese medicine. It was also very useful for preservative purposes especially in the embalming of the corpse. In India, it is used for incense making, cooking ingredient and used in religious ceremonies. Among the Arabs, camphor is used for embalming, food ingredient and medicinal remedy but also in ointment for the treatment of rheumatic diseases and muscle pains as well as for sprain and pulled muscle. Turtle shell was also widely recorded as Brunei’s trade commodities. Turtle shell also formed part of Brunei’s tribute to the Chinese Court in the 10th Century. During the Ming Dynasty, pearls were also included in Brunei’s tribute to China. The Portuguese recorded that cowrie shells were part of Brunei’s exports to Malacca. Pearls obviously are still popular even up to today. But turtle shells are no longer being traded. In the older days, turtle shell is an important part of Chinese culture because it symbolised long life and fertility, an emblem of strength, longetivity, and endurance and the universe. The shells can be used as serviceable and decorative items and used for a variety of things such as rattles in ceremonial dances, shamanic healing tools and even for divination purposes. Cowrie shells are used more ornamental purposes but can also be used as currency. Bees wax was mentioned as another important ancient trade export. Bees wax is a natural wax produced in the bee hive of honey trees. It is made from the nectar of flowers thus giving it a sweet smell. Candles made from bees’ wax gave out sweetly smell without the need to add fragrance and perfume. The candles also lasted longer and do not drip. Brunei’s gharuwood is still known till today. This was much exported in the past. Their prices today can be in tens of thousands for a litre. Gharuwood is the the dark resinous heartwood of the Aquilaria and Gyrinops trees. The Egyptians used the wood as part of their death rituals more than 3,000 year ago. Another wood known as the lakawood was also exported from Brunei mentioned in the Chinese records as far back as the 13th century. Lakawood is a scented heartwood and root wood of a thick liana, Dalbergia parviflora. Its strong and penetrating smells work to counteract bad smells. They are usually burned as incense. One item exported from Brunei in the old days which is quite surprising is gold dust. Brunei has never been known as a producer of gold. But in the 13th century, foreign traders brought gold to Brunei to be traded in the local market. In the 16th century, a Spanish report mentioned that gold was among the trading items brought by Brunei merchants to Malacca. Gold was probably mined in the Kalimantan region such as in Sambas and Banjarmasin. Sago deserved a quick mention as it was mentioned by Tome Pires in 1515 as one Brunei’s commodities in Malacca. Sago was considered by the Portuguese as food for the lower classes. Sago is the dried extract from the stem of a palm tree has been used in Brunei more than a thousand years ago and up to now is still being used locally. Another tree produce, the dammar was part of Brunei’s exports as recorded by Pigafetta in 1521. Dammar is a kind of gum obtained from a type of trees and are used for many roles including incense burning, foods and medicines. The Chinese also used it to fasten blades onto wooden handles, to coat and seal earthenware pots, boats and other river or marine vessels. Hopefully this article will serve as an introduction to what Brunei was able to produce and export in the past. Haji Mohd Rozan bin Dato Paduka Haji Mohd Yunos is the Executive Director, Centre for Strategic and Policy Studies. He had served in the Brunei Government since 1987. He had written for his column The Golden Legacy in the Brunei Times since 2007.